Luncheon Club caters primarily for retired people and is open to anyone in the community. We started in June 1993 and we still have one or two of the founder members with us. 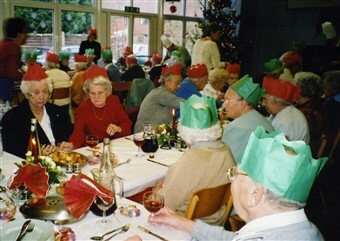 The Luncheon Club is very well attended with anywhere between 45 and 60 members attending at any one time. Transport can be arranged for those that need assistance and members are asked to make a donation of £3 for each club meeting. Luncheon Club is a very labour intensive event and our thanks are due to the many people without whom it just would not happen. We meet on the third Wednesday of each month during term time. Please see the calendar to check when we meet. If you are interested in attending please contact the church office or speak to Mike Sheppard.